Multiple Seibertron.com users, including reluctantyouth and Cyber Bishop have sent us notifications about the second wave of Generations Combiner Wars finally appearing ready to ship from HasbroToyShop.com - though at the time of writing this, most of them are already listed as out of stock, with only Offroad and Huffer actually still available. What this does mean, though, is that we can expect more wave 2 figures showing at general retail, potentially! Refresh your memory as to what it includes with our galleries, and make sure to help us keep the Sightings section updated, too. I received an email last night that my wave 2 deluxe order had shipped. Tracking says it's supposed to be delivered today. So hopefully that is true and I will have a fun weekend. Yep, I got the same. Looks like they sent them express to make up for the delay. That's pretty cool of them. 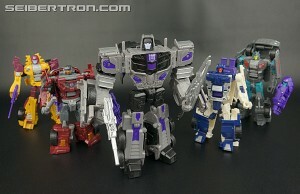 My BBTS shipment with the Megatrons should be in a week after I think. OH, that would explain that then. Well cool hasbro! Yep mine shipped as well. Just told Pile of Loot to send so I can get Motormaster, Dragstrip, Huffer, Black Jack, Nemesis Prime and Cliff Jumper in hand as well. They have been waiting for a while now I can put together Menasor and Full Superion. Shipped last night, will arrive today. So I agree with the poster above must have upped it to express because of the delay. I will take that. carytheone wrote: I received an email last night that my wave 2 deluxe order had shipped. Tracking says it's supposed to be delivered today. So hopefully that is true and I will have a fun weekend. My tracking shows the same thing. Guess my son will be getting them for Easter after all. Did you login to your HTS account and look your at order status? That's how I knew mine shipped, no email just saw the shipping and tracking number, threw that in FedEx posted it out for delivery today. MenaceRX wrote: Did you login to your HTS account and look your order status? That's how I knew mine shipped, no email just saw the shipping and tracking number, threw that in FedEx posted it out for delivery today. Yes, please check your account at HTS before sending angry emails. Air Raid is out on the FedEx truck right now and I still haven't gotten an email saying it has shipped. Yes, HTS can be bad with their email, and I sometimes get the mail the day AFTER the item arrived. Yeah, no, I'm keeping an eye on the order status page of my HTS account. And don't worry, I won't send anything angry, I'm just getting antsy - probably too antsy, I admit - that people with 4/27 ship dates have started seeing theirs go out, yet mine with a 3/27 date hasn't moved. But like I said, I'll give it another day, mayber moe if others are still seeing updates as the week progresses. I didn't realize till a few days ago that my order had been backordered till 4/27. I checked my tracking info again just now and its showing next Tuesday, so I guess they didn't upgrade shipping on all the orders. Still, next week is a lot sooner that the end of April so its still a win in my book! You know, I don't really remember having an issue like this inthe recent past. I wonder, is this still the after-effect of the port stikes, or is it a case of supplay/demand ratios not balancing? port strike. wave 2 was supposed to be out a long time ago. 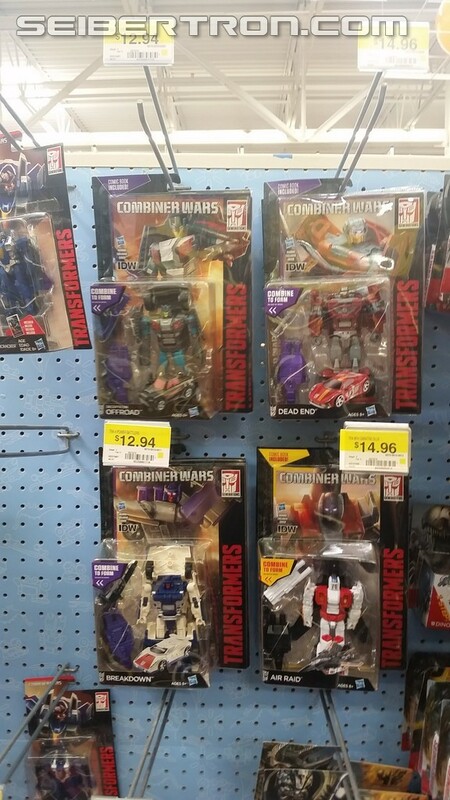 Thanks to fellow Seibertronian, DrLegend, we have our first legit (and proven) sighting of Deluxe Wave 2! This wave consists of Air Raid, Breakdown, Dead End and Off Road. I went to Wal-Mart this morning near my work in Mesa, AZ and found an assortment of the new figures and limbs. Happy hunting to the rest of you! That's very cool! Some of my pals around NC have told me in a text that they're out and about at some Walmarts here too. Nice to see that, just maybe, these are hitting roughly everywhere (geographically speaking) about the same time? I luckily caught this yesterday morning and grabbed the remaining parts for Menasor (minus Motormaster sadly) and then I also managed to find the Silver Megatron in Toys r us! I have yet to find them in my neck of the woods yet. My order from hasbrotoyshop.com is on FedEx truck for delivery today!! Yay. -I originally ordered on hasbrotoyshop.com on 03.12.15 and got 20% off/free shipping. My expected shipping date was 03.27.15. -I called customer service that day and was told shipment had been delayed from manufacturer. My order went from standard/shipping 03.27.15 to standard/backorder. -Then I was really happy to see figures were IN STOCK and available for purchase 04.01.15. My order was upgraded to express/not shipped. -I got confirmation that figures shipped overnight yesterday around 6:16 pm Central Time. I cannot wait to get home and assemble me some bots. I got Motormaster on same order already so wave 2 deluxes and Motormaster was $79 total. I was going to take all the negative things I've said about hasbrotoyshop.com back, but got my Generations Leader Megatron yesterday and the figure box was ripped to hell. It looked like someone yanked figure out of shipping carton and almost completely tore off one side of packaging. The shipping box arrived unscathed. My Superion limbs arrived around noon today. Call me impressed. My Wave 2 bots have been delivered. I'll be picking them up right after work today! 5,040 pages were recently viewed by 1,019 unique visitors. This page was viewed 1 times on Saturday, April 20th 2019 1:26pm CDT. © 2019 Seibertron, Inc. DBA Seibertron.com. All Rights Reserved. Established June 2000. Seibertron.com is owned by Ryan Yzquierdo.